Environmental activist Marina Silva has unexpectedly found herself centre stage in Brazil's presidential election campaign, following the death in a plane crash of Eduardo Campos, the candidate for the Brazilian Socialist Party (PSB). But Ms Silva is an experienced politician with an impressive record. A former environment minister during the government of Luiz Inacio Lula da Silva she is seen as having the national and international profile to replace Mr Campos. In 2010, she ran for president for the tiny Green Party and secured 19 million votes, forcing the race into a second round. At the time, she said she wanted to be "the first black woman of poor origins" to reach the presidency. Most people expected her to try again in 2014. But after her newly created party, the Sustainability Network, failed to achieve the 500,000 signatures needed to be officially recognised, she joined Mr Campos as his vice-presidential running mate. Now she will face the challenge of remaining faithful to his legacy - which PSB officials are determined to hold her to - while staying true to her own ideals. Ms Silva opposed some of Mr Campos's alliances with regional candidates - especially when they were members of the country's powerful agribusiness lobby, which accounts for over one fifth of Brazil's GDP. Having locked horns with the sector during her time as environment minister, she may now have to reach a compromise with its backers. Ms Silva was born into a family of 11 children in the northern state of Acre, in the heart of the Amazon. As a child she would walk several miles in the forest with her father and siblings every day to collect rubber from trees. She campaigned alongside the rubber tapper and trade union leader Chico Mendes, who was killed in 1988 for his activism. Throughout her childhood years, she was seriously ill a number of times - suffering from hepatitis, malaria and contamination by heavy metals. As a result she suffers from frail health and has an intolerance to a long list of things - such as cosmetics, perfume, alcoholic beverages and red meat. This and her devout evangelism have marked her style. She uses no make-up and prefers simple and sober clothing, mainly long dresses. She often wears her hair in a tight bun tied by a thin braid. 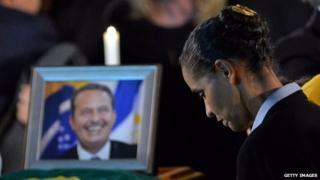 It is a stern image, but according to political scientist Ricardo Ismael she also conveys personal warmth. "She inspires confidence in ordinary voters - that she is accessible," explains Mr Ismael, who is a professor at the Pontifical Catholic University of Rio. "Wherever she goes, she approaches people and allows herself to be approached. She seems frail but conveys remarkable strength. "She knows Brazil. She knows the problems from seeing them on the streets, or living them," he adds. Aged 16, Ms Silva left her community of rubber workers in Bagaco and moved to Rio Branco, the capital of Acre, to study and get treatment for hepatitis. She was taken in by nuns in a convent and became the first person in her family to learn how to read and write. "When I saw my name on the list of people that had passed the course, I knelt down and gave thanks to God. That list saying I was literate opened doors for me," she said in an interview with BBC Brasil years later. After she left the convent, she went to work as a domestic maid in exchange for lodging. Ms Silva was widely praised on an international level for her work as environment minister under President Luiz Inacio Lula da Silva. During those five years, hundreds were arrested for crimes against the environment, a record area of territory was set aside as indigenous reserves and there was a significant slowdown in rainforest deforestation rates. But she also faced defeats such as the approval of the first genetically modified soybean crops, which she had opposed. Fearing her agenda was losing ground, she resigned in 2008 and a year later left the governing Workers' Party. Opinion polls conducted following last year's wave of protests against World Cup spending, corruption and poor public services suggested Ms Silva was the only politician whose image had benefitted from the unrest. Political scientist David Fleischer of the University of Brasilia says she appeals to the younger generation and those who want change. "Those who took to the streets saying they didn't feel represented by Brazil's political system were still undecided, and now many will choose to vote for her", he says. However, some of those critical of the bigger establishment parties are also uneasy about Ms Silva's devout religious views, fearing she is too conservative on social issues such as gay marriage and abortion. Even though the protests have diminished, her supporters believe there is still a yearning for change. They hope that the desire for change along with the emotional circumstances of her selection will result in a powerful boost to her campaign just weeks ahead of the election.